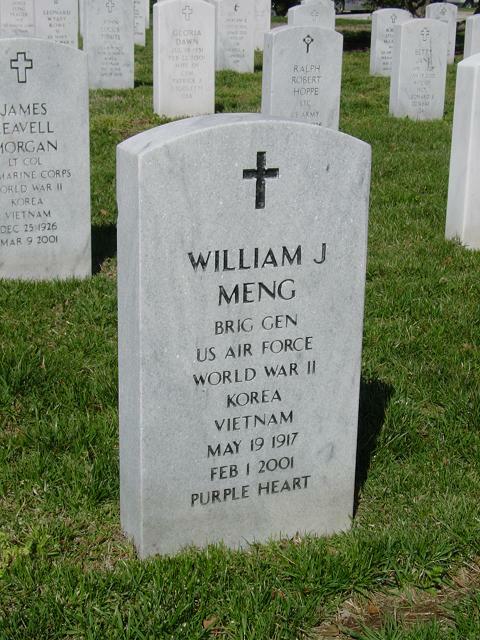 William J. Meng was born at North Middletown, Kentucky, in 1917. He attended High School in North Middletown where he graduated in 1935. He entered Transylvania College in 1935 and completed three years majoring in economics. He participated in the University of Maryland off-duty education program while on active duty in the Washington, D.C. area. In November 1939 he entered the U. S. Army Air Corps as an aviation cadet. He completed flying training in August 1940 and was commissioned a second lieutenant in the Air Corps Reserve August 30, 1940. After flying training his first assignment was the Panama Canal Zone where he served as an A-20 pilot and squadron engineering officer. Captain Meng's next assignment was Lake Charles, Louisiana, as an A-20 squadron commander. In January 1944 he was transferred to the European Theater of Operations where he served as an A-20 squadron commander, deputy group commander of an A-26 group and later as air inspector of the 9th Bomber Command. While leading the A-20 group on the late D-Day mission over France he received wounds from 88 mm flack. During his tour in the European Theater of Operations, he was awarded the Distinguished Flying Cross, the Air Medal with eight oak leaf clusters and the Purple Heart. Returning to the Zone of Interior after World War II, Lieutenant Colonel Meng was assigned duty as the air inspector, 311th Reconnaissance Wing at Buckley Field, Colorado. His next assignment was commander of the 7th Geodetic Survey Squadron. The mission of this squadron was geodetic survey using SHORAN equipment. To perform this mission the squadron was assigned B-29s, B-17s, OA-10s, C-47s and helicopters. From July 1948 to December 1949 he attended the Air Command and Staff School at Maxwell Air Force Base, Alabama. After Command and Staff School, January 1950 to January 1951, Lieutenant Colonel Meng assumed the duties of inspector general, 2nd Air Force. In January 1951, Lieutenant Colonel Meng was assigned to the 91st Strategic Reconnaissance Wing. The wing was equipped with RB-45, and the first multi-jet unit in the Strategic Air Command. He was deputy for operations and materiel during this assignment. He was promoted to the grade of full Colonel, effective January 19, 1951. The next assignment was as deputy wing commander, 26th Strategic Reconnaissance Wing at Lockbourne, Ohio. From Lockbourne, Colonel Meng transferred to Sidi Slimane Air Station, Morocco as director of operations for the 5th Air Division. He returned from Sidi Slimane back to Lockbourne Air Force Base as commander, 26th Strategic Reconnaissance Wing. During his tenure as commander, 26th Strategic Reconnaissance Wing, he commanded "Home Run Task Force" at Thule Air Base, Greenland. Director of personnel for 8th Air Force was the next assignment for Colonel Meng. While with 8th Air Force, Colonel Meng was selected to attend the National War College in Washington, D.C.
After graduation, Colonel Meng was assigned the Strategic Division, Directorate of Operations, Headquarters U.S. Air Force. After 10 months in this duty he was selected as executive to the vice chief of staff, Headquarters U.S. Air Force. In June 1963, Colonel Meng assumed the duties of vice commander, U.S. Air Force Tactical Air Reconnaissance Center at Shaw Air Force Base, South Carolina. On October 9, 1963 he was promoted to the grade of Brigadier General. General Meng flew 250 missions of anti-submarine patrol and amassed 800 combat flying hours in the Caribbean Theater. He flew 50 combat missions for a total of 170 combat hours in the European Theater of Operations. General Meng has more than 5,600 hours flying time in a variety of aircraft including the A-20, A-26, B-17, B-29, B-50, RB-45, RB-47, KC-97, KC-135, B-52 and B-58. He is presently current in the EF-101 and flies it regularly. The Air Force biography ends in 1963 and does not mention Dad's job at Langley Air Force Base as Director of Personnel for Tactical Air Command (1964-65 era) nor his position in Bangkok, Thailand with SEATO (1965-67). He and Mom retired in 1967. After their retirement from the AF, he and my mother lived in Fort Worth, Texas, where Dad worked for General Dynamics on the F-111 A for about 5 years. They moved to San Antonio in the mid 70s, where Dad earned another college degree from Trinity University. They moved into the Army Residence Community about 5 years ago. After Dad's death, my mother was presented with a medal from the Secretary of Defense commemorating Dad's participation in the Overflights of Russia, when he took the men and planes from the 26th Strategic Reconnaisance Wing to Thule,Greenland, specifically during the spring of 1956. I found the info about those overflights on the Internet, too, and I remember that he was away for about 3 months. Dad died on February 1, 2001 with Alzheimers, but to the very end he still told stories about D-Day, and when he did, his eyes sparkled.